It's been SUCH a long time since I knit a hat, which is strange because Hugs is named for my hat knitting habit. I like hats because they don't have to come in pairs, they are highly visible when it comes time to show off your hard work, it's not crazy to have more than one in your wardrobe, and you can knit them in bulky yarn and be done fast. And yet: here we are. 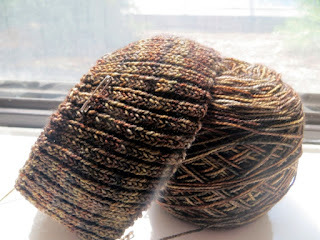 Knitting a hat in sock yarn with about a million stitches on the needles. I don't love working on these Addi lace tip needles, either. They are really sharp on my fingertips! But the yarn - Viola, of course, nobody else I know of does this very subtle colour shifts - is so beautiful, I am enjoying this knit anyway. 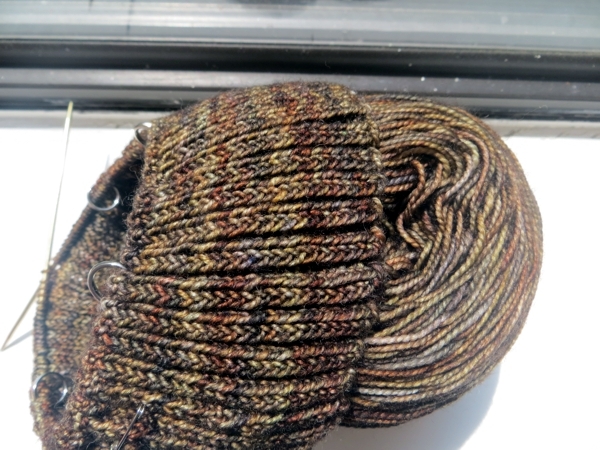 Normally colour pooling bothers me but the delicate swirls on this ribbing really pleases me. Another bonus: this hat is going to match my hair almost completely! I have strands of almost-black, coppery red, and gold - plus of course some silvery grey, now. As long as I don't mess up the shape, it won't matter to me that it doesn't have red in it to match my parka, because it will just be an extension of my head. Of course that's a long way off because Sock Yarn. Plus, I'm not sure yet whether I overcompensated for the last attempt being much too small... I might still have to rip out and reknit. Not that I'm thinking about that right now because we're coming into a long weekend and I just want to enjoy it! I mean I'm even thinking about taking a break from socks and this hat so I can do some spinning. For now though... oh, it's just a happy thing to look at a partway-done hat in the sunshine, isn't it? 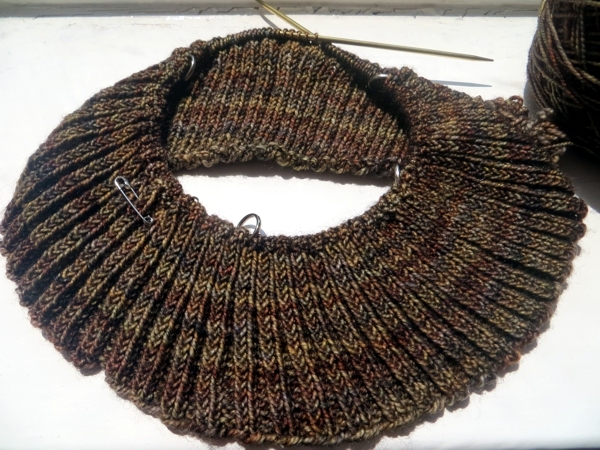 Knowing you can knit a keep-warm project and not need it for a few more months, because the weather is so lovely? Love this color. I've knit a few children's hats in sock yarn and folks think they are bought hats because the stitches are so much finer than "hand knit" hats. Not sure if that's a compliment or not.